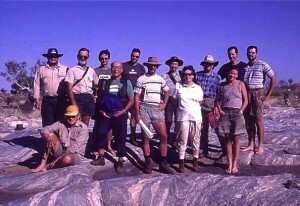 The 4th International Archean Symposium was held in Perth, Western Australia, in September 2001. In spite of airline problems, about 400 peoples were able to attend the meeting. In one week of symposium, we had a lot of oral presentations including keynote syntheses by well-known scientists. We also had nicely organised poster sessions, in the large Winthrop Hall. Posters remained on display all week long, which allowed a lot of time to see most of them, and to discuss with lots of people. Tons of new data and interpretations were proposed; however, instead of settling old debates, they rather fuelled them. While most petrologist and geochemists presented more and more evidence for subduction and terrane accretion in the Archean, structural geologist and people involved in analog modelling insisted on the role of body forces, vertical tectonics and diapiric dome-and-basin structures. That discussion came again and again, as a leitmotiv, all week long. Poster sessions, coffee break and lunches provided ample time to follow discussions starting after a presentation; this conference was really a success in that aspect, a good place to meet people and discuss with them. Lots of field trips were proposed; due to Ansett Airline collapse, we had to go by bus, instead of flying, which meant that we had 10 to 20 hours of bus ride, and back again some days later! As far as I’m concerned, I was on a Pilbara field trip, which was superbly organised, and took the ~15 of us (plus staff) in some of the oldest, well-preserved greenstones in the world. We’ve seen cherts and stromatolites (the oldest known in the world, in the 3.49 Ga Dresser formation), growth faults, komatiites, gneisses and migmatites, shear zones, most of them between 3.5 and 3.2 Ga old. We had hot days and cold beers, and heated discussions on the outcrops and at the evening camps. Are those domes diapiric, or are they compression-related structures? Finally, we had nice spring weather, allowing us to enjoy the pleasant surrounding of The University of Western Australia, Matilda Bay and King’s Park, including views on the skyline of Perth and flowers everywhere.